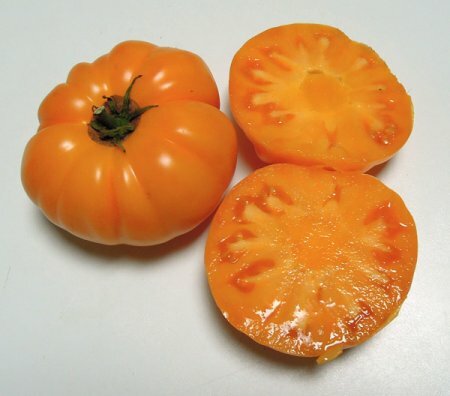 ​Loxton Lass originated from a cross between Rosella Purple and Orange Heirloom made by Patrina Nuske Small in 2009 named Rosy F1. Loxton Lass​ is an early to mid-season rugose regular leaf dwarf producing medium smooth oblate orange fruit in the 7 – 10oz range. They are delicious, tender sweet and juicy and earlier than Loxton Lad. Plants have sturdy stems, robust rugose foliage, and reach about a metre+/ 3-4 ft by end of season. Loxton is a town in South Australia’s riverland citrus growing region. This variety was selected and named by Patrina.